The light stand is made of aluminum alloy, making it strong for heavy duty work. Made by the industrial standard, it supports all major brands of photo equipment such as reflector, soft box, different lights, umbrella, background, etc. Height is adjustable from 3.18ft to 8.53ft. 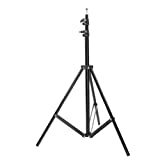 This light stand is constructed from aluminum alloy, giving it exceptional strength for heavy duty work. For simple storage and transport, the stand collapses easily and is very lightweight to carry. Its solid locking capabilities ensure the safety of your lighting equipment when in use. Compliant with industry standards, this stand supports all major photo equipment including reflectors, softboxes, lights, umbrellas, backgrounds and more. It is a perfect stand both for studio and on-site use! This entry was posted in Discount Photography and tagged 260CM, about, Backgrounds, Feet, Lights, Neewer, Photography, Professional, Reflectors, Stand, Studio by Ball Photo. Bookmark the permalink.